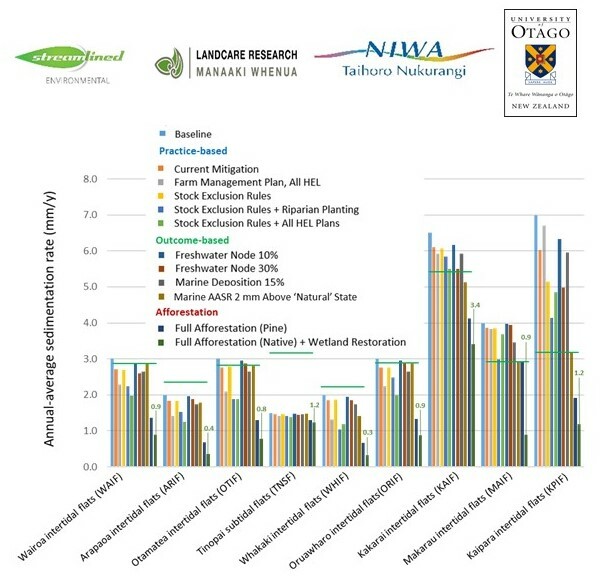 Streamlined Environmental led a consortium of researchers that developed a model of Kaipara Harbour and its catchment for assessing costs and benefits of sediment mitigation. The model predicted the extent to which various objectives framed in terms of sediment “attributes” – sedimentation rate in the harbour, and suspended-sediment concentration, euphotic depth and water clarity in streams and rivers – are achieved by different sediment mitigation strategies, and the associated costs to the public, landowners and sector groups. A summary of the Study is available here. The results will be used to plan soil conservation and erosion mitigation in the catchment. The project was funded by Northland Regional Council, Auckland Council and the Ministry for the Environment. The team consisted of Malcolm Green, Ngaire Phillips and Ashlee Dunsmuir (SEL), Adam Daigneault, John Dymond, Les Basher and Alexander Herzig (Landcare Research), Andrew Swales, Andrew Hughes and Drew Lohrer (NIWA), and Christoph Matthaei (University of Otago).